If you are missing some or all of your teeth, removable partial or full dentures may be the solution. These are custom fit devices molded to your mouth that can allow you to eat and smile again. We offer a full suite of removable solutions in our office, from partial dentures replacing only a couple of missing teeth to full blown implant supported dentures. For patients who are missing only some of their teeth, removable partial dentures are a solution. 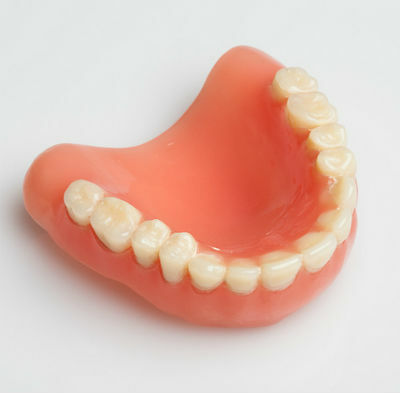 A partial denture is custom molded to your gums and remaining teeth, thus allowing it to nearly “lock in” when placed. To the right is a picture of two types of partial dentures. The appliance on the left is made of cast metal. This type is very durable and can stand up to chewing pressures. The downside is that metal can sometimes be visible to others while you smile or yawn. The type on the right is made entirely of acrylic. It blends in nicely with the surrounding gum tissue. The drawback to this style is that it is less durable and is not held into place as effectively. A third type not pictured, called a Valplast, is a custom acrylic appliance with more strength than the one pictured. Drs. Nicholas or Carla Calcaterra will explain all the different options to you and make a recommendation based upon your unique needs. Of course, we always recommend an appliance supported by dental implants, and we will discuss those options with you as well. For those individuals with no remaining teeth on either arch, then a complete denture is necessary. The photo on the left shows a complete upper denture. Just like partials, a mold is made of your mouth and gums and then a denture is custom made for you based on that mold. Most are made out of pink acrylic for the gum tissue with teeth made from tooth colored acrylic. The denture is worn during the day but always taken out at night prior to going to sleep. Some individuals have broken down teeth and need to move into dentures. We are experts in doing full mouth extractions and immediate dentures. That can be accomplished with or without sedation. Some patients are able to adjust to eating, chewing, and smiling with complete dentures quite easily. Some find the adjustment more challenging. The challenges arise from the fact that there are no remaining teeth to support and stabilize the denture. As a result, the denture has a tendency to move. Some patients have to use adhesives such as Poligrip or Fixodent to allow the dentures to stay in place. Drs. Nicholas or Carla Calcaterra will discuss with you if an adhesive will be beneficial to you. With the success of dental implants over the past twenty years, there are a variety of solutions to stabilize dentures using implants. These range from 2 implants on the lower jaw to help a lower denture stay in (called an overdenture) to multiple implants and sophisticated appliances. We will discuss those options with you if you are a good candidate.